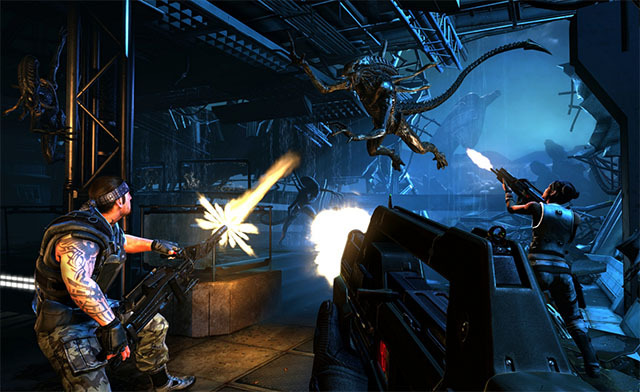 Aliens: Colonial Marines was very poorly received by critics and gamers alike when it first launched back in 2013. Part of this terrible reception was the badly implemented enemy AI in the game. Apparently, the enemies in the game weren’t really a challenge, and seemed to not have the ability to work as a team to surprise the player, or to do anything other than walk into the line of fire to die rather easily. However, Jamesdickinson963 of ModDB, who has been working on improving the game, has discovered a typo in the game’s code that may be (at least partly) to blame for the terrible AI exhibited in the game. According to his findings, one of the game’s INI files misspelled “tether” as “teather” and hence didn’t get executed at all. According to him, correcting the spelling back to “tether” improves the game’s AI performance by a considerable amount. Kotaku tested the change out for themselves and found that the change does improve the game’s AI mechanics by quite a bit. However, they did note that it still doesn’t fix a lot of the issues that reviewers and critics took with the game back in 2013 when it launched. This line can be found in the PecanEngine.ini file that will be located in “My Documents\My Games\Aliens Colonial Marines\PecanGame\Config\PecanEngine.ini” or somewhere similar based on where you installed the game. So try it out if you want to, and let us know if you noticed any observable difference in the game.